The Beatitudes are one of the most beloved passages in scripture. They speak about God’s promises, they are uplifting and comforting. But what do they really mean? This is question is one we will explore this week, but first we must agree about what we are reading. When I read scripture I do so primarily from the New Revised Standard Version (NRSV). I also consult the New International Version (NIV) and the Good News Translation (GNT). The GNT is the pew Bible at St. Andrew’s and I want to ensure that in a sermon I am using words and language that the congregation has heard read in the scripture readings themselves. However, often various Bibles will translate words in very different ways. Often deriving meaning which does not appear in the original Greek language. This is why I often recommend that for Bible study two or three different translations be used, in order to attempt to get a clearer sense of what the biblical author was trying to convey. NRSV – Blessed are the poor in spirit, for theirs is the kingdom of heaven. GNT – Happy are those who know they are spiritually poor; the Kingdom of heaven belongs to them! These two translations are similar, but different enough to be concerning. In the NRSV we read that the poor in spirit are blessed. In the GNT it is those who are aware they are spiritually poor who are happy. The GNT includes a level of self-awareness. The question we need to ask ourselves is what is actually found in Matthew’s gospel? The answer, a translation that is closer to what is found in the NRSV. As you read scripture be aware that the translator is making decisions about what a word means and that decision may move you further away from what was originally written. The link to our scripture passage this week will show the NRSV and GNT side by side for comparison. What do you think Jesus was trying to teach in the Beatitudes? 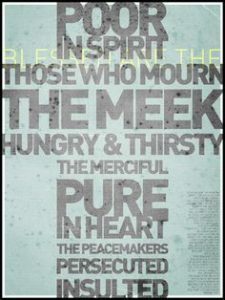 Are you one of those who Jesus mentions in the Beatitudes? How do you feel about different translations of the Bible? Heavenly Father, draw us close and inspire us by your word. Encourage us to always seek your truth through faithful study and prayer on holy scripture. In Jesus name we pray. Amen.